These four communities are taking big strides toward health equity by listening to voices from all backgrounds and acting on a shared interest. Alani Payne and others enjoy a day in the park at San Pablo, California’s National Senior Citizens Day Summer Picnic. Photo: Copyright 2017 Bud Glick. Courtesy of the Robert Wood Johnson Foundation. Every community in America has its own DNA. Whether large or small, urban or rural, these places have unique histories, with varying strengths and diverse challenges. Robert Wood Johnson Foundation Culture of Health Prize winners, though different, are kindred spirits and have key attributes in common. Chief among them is a belief that success requires listening to many voices and understanding that everyone deserves economic opportunities, health services, housing and transportation, education, access to healthy food, and more. Here are some of the compelling ways the 2017 Prize-winning communities are ensuring that inclusion and opportunity-building are cornerstones of their efforts to improve health for everyone. At a Friday night party in the San Pablo Senior Center, dancers swinging to “Johnny B. Goode” can be overheard speaking Tagalog, Mandarin and Cantonese, and, of course, Spanish and English. San Pablo is a kaleidoscope of people. Residents of Hispanic or Latino descent now make up the majority, representing 57 percent of the population. Two out of three residents speak a language other than English at home and 45 percent were born outside of the United States. Diversity is part of the legacy of San Pablo, a stagecoach stop during the Gold Rush, and the city has taken intentional steps to make the community as inclusive as possible across many areas. By improving interactions, the city hopes to become a more cohesive place to live. Some efforts have been small but meaningful, gestures to build connections. To bridge the generational gap, the senior center makes a point of bringing young visitors to mix with older members, programming activities like a Top Chef-style cooking competition with intergenerational teams or a tutorial on how to take cellphone selfies. “There’s a disconnect between generations that we are trying to bring together,” says Vicky Voicehowsky, the senior center recreation supervisor. The city, meanwhile, tries to remove barriers so as many residents as possible can participate in planning meetings or forums on issues that affect them. It holds events at multiple times and different venues, often offering childcare and food, as well as translators. “By including every sector of the community, we actively engage our residents and encourage them to be a part of the decision-making process,” says Greg Dwyer, the city’s director of community services. Other initiatives in San Pablo have been more deliberate attempts to foster a deeper sense of connection for the well-being of everyone. On that front, the San Pablo Police Department has led the way. The department was the first in the region to offer free certified emergency response training in Spanish, a clear example of how the city’s commitment to being inclusive is a benefit for not just a few, but for everyone. San Pablo sits on an earthquake-prone fault line and has two refineries within eyeshot, so having the Spanish-speaking majority trained in safety procedures would help the community at large in the event of an emergency, says Brian Bubar, a commander in the San Pablo Police Department. By equipping people with the skills they need to take care of themselves and their neighborhoods, “it builds a sense of ownership, and that partnership is strengthened,” he says. The emergency training is just one piece of a broader community policing approach, which includes locating officers within the middle school, offering youth programs, and sponsoring a Community Police Academy, which gives anyone an up-close look at how the police department works. Once a week over the course of 10 weeks, the department opens its doors for talks and demonstrations, such as showing a K-9 unit or taking participants on ride-alongs. Not only does that give people a better understanding of policing, it also gives the department insight into what the community is thinking. 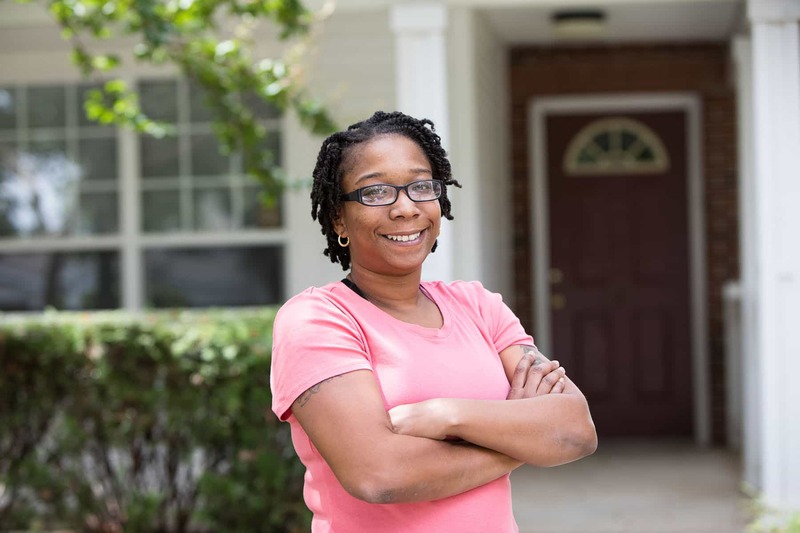 Former Center for Workforce Innovation participant Kiocia Wilkerson in front of her home in Richmond, Virginia. Photo: Copyright 2017 Joshua Kohanek. Courtesy of the Robert Wood Johnson Foundation. To lift families out of poverty, the city is working to expand employment possibilities, supporting individuals along the way. At the Office of Community Wealth Building’s Center for Workforce Innovation, participants are matched with intensive case managers who connect them to education, vocational training, and job opportunities, provided through partnerships with local higher education institutions and businesses. The city also has opened “Future Centers” in every Richmond public high school to prepare students for college and careers through mentoring, college application support, and soft-skills training. But she feels herself moving forward, with help from the Center for Workforce Innovation and Building Lives to Independence and Self-Sufficiency, or BLISS. This intensive program, launched in 2015, provides similar support to families that live in public housing. Steve Knepp is a rare sort of early childhood educator: one with a commercial driver’s license. He needs it to drive a specially outfitted, Wi-Fi enabled school bus—carrying books, toys, craft and science supplies for the kids, and computers for the grown-ups—across Garrett County, Maryland. Reaching out is a formula the medical center has found success with already. It matches patients at high risk of readmission with nurse navigators, social workers, and community health workers, who coach them through recovery over the phone and at their homes. Today, the center has the lowest readmission rates in Maryland. Through the health department’s nurse home visiting program for new moms, Sonya Kisner was able to see that her baby—now just over a year old—was developing and growing well. Her nurse also helped her set and achieve goals for herself, such as finishing her high school degree online and getting a driver’s license. This year, she’s starting higher education courses to be certified as a veterinarian assistant. Now, Blacksnake and others in the Nation are on a mission to address what they call “multigenerational trauma.” They say centuries of cultural erasure, loss of land, and imposed family breakdown have had widespread effects on the Seneca people, including disproportionately high rates of dropout, incarceration, drug and alcohol addiction, depression, and family violence. To get at the roots of these problems, the Nation is targeting efforts at the very young and those struggling with addiction. Gerri Jimerson (left) reads with Tgedeowita’ Rodriquez, 2, at the Early Childhood Learning Center library in the Seneca Nation of Indians’ Allegany Territory in western New York. Photo: Copyright 2017 Tracie Van Auken. Courtesy of the Robert Wood Johnson Foundation. 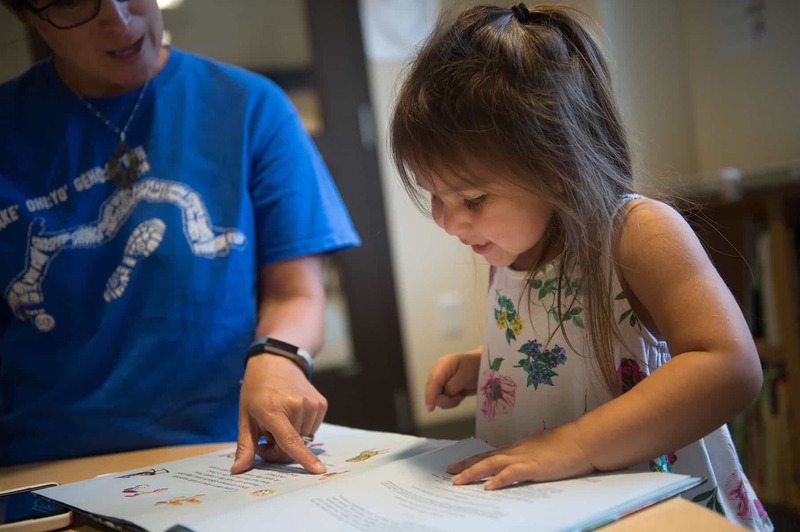 In her vision, there would also be daily language training for existing preschool teachers and staff to create a strong connection to Seneca language and culture. Professional development programs would create a pipeline of new early childhood teachers. Clubs and other learning opportunities would interest children in careers from an early age. And health fairs, fitness events, and educational workshops would promote health, wellness, and parenting skills among families. Is your community coming together to promote health for all? Learn more about the RWJF Culture of Health Prize at http://www.rwjf.org/prize. This content was written by the Robert Wood Johnson Foundation; it is not written by and does not necessarily reflect the views of The Atlantic's editorial staff. See our advertising guidelines to learn more. Share this story with a friend or colleague who cares about health in America.